I have just embarked on a new project for the workshop, I am replacing my current outfeed/assembly table with another that has a few features that my current one doesn’t have I will go into that in a little while. Since I am now working full time this project is likely to take a while to complete and will probably only get some quality shop time at home during the weekends and possibly a few nights as well. The base cabinet will have 8 drawers (4 on each side) and 4 cabinet 2 on each side. 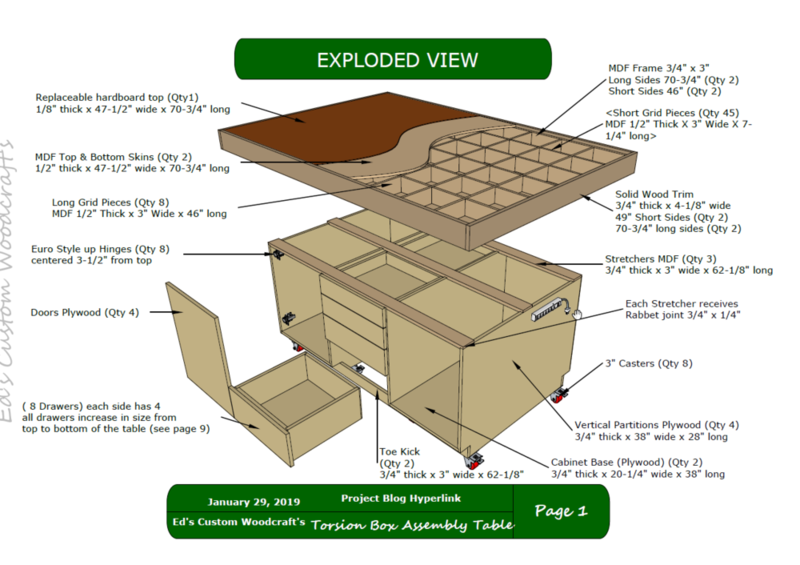 How to make a Torsion Box Assembly Table. A method learned from David Marks at http://djmarks.com When assembling projects, nothing beats a wide and spacious dead flat surface. And one of the easiest and most efficient ways to create a dead flat surface is by constructing what is known as a torsion box. There are a lot of materials to be purchased for this project and can be considered and expensive build but if you break the project down into sections the cost will not hit you all at once, at least that is what I am doing. Below is what you will need to build this table. Since I am talking the cabinet base first I got the 3 full sheets of plywood as that will be enough to build the cabinet base, you will need to get a 1 sheet of 1/2” plywood for the drawer bottoms but that can be gotten later on.